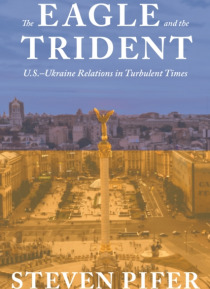 An insider's account of the complex relations between the United States and post-Soviet UkraineThe Eagle and the Trident provides the first comprehensive account of the development of U.S. diplomatic relations with an independent Ukraine, covering the years 1992 through 2004 following the collapse of the Soviet Union. The United States devoted greater attention to Ukraine than any other post-Sovie… t state (except Russia) after the breakup of the Soviet Union. Steven Pifer, a career Foreign Service officer, worked on U.S.-Ukraine relations at the State Department and the White House during that period and also served as ambassador to Ukraine. With this volume he has written the definitive narrative of the ups and downs in the relationship between Washington and newly independent Ukraine.The relationship between the two countries moved from heady days in the mid- 1990s, when they declared a strategic partnership, to troubled times after 2002. During the period covered by the book, the United States generally succeeded in its major goals in Ukraine, notably the safe transfer of nearly 2,000 strategic nuclear weapons left there after the Soviet collapse. Washington also provided robust support for Ukraine's effort to develop into a modern, democratic, market-oriented state. But these efforts aimed at reforming the state proved only modestly successful, leaving a nation that was not resilient enough to stand up to Russian aggression in Crimea in 2014.The author reflects on what worked and what did not work in the various U.S. approaches toward Ukraine. He also offers a practitioner's recommendations for current U.S. policies in the context of ongoing uncertainty about the political stability of Ukraine and Russia's long-term intentions toward its smaller but important neighbor.